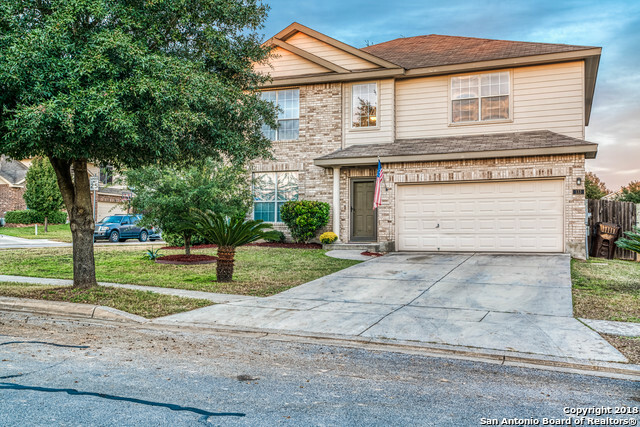 All FALCON RIDGE homes currently listed for sale in Cibolo as of 04/25/2019 are shown below. You can change the search criteria at any time by pressing the 'Change Search' button below. "***COMMUNITY POOL AND PLAYGROUND***Great location, with a great floor plan! This beautiful 4 bedroom 2.5 bath house offers a floor plan that can be changed around many ways to suit your needs! Stainless steel appliances with granite countertops will help making meals enjoyable. With freshly painted interior, and manicured exterior, you wont be ashamed to call this your new home." "Meticulously maintained hm ready for move in! Kitchen updated w/ granite counter tops & stone facade on bar area. Open floor plan w/ 2 living areas, high ceilings & plenty of windows for natural light. Spacious master bedroom includes newly renovated en suite w/ modern counter tops & nicely designed rock & tile shower. Enjoy the outdoors & entertaining w/ your large covered & tiled back patio. Roof, exterior paint, & water heater all recently replaced! Convenient to shopping, dining, Randolph AF"
"GREAT LOCATION !! WONDERFUL LANDSCAPING !! GREAT DRIVE-UP APPEAL !! WONDERFUL KITCHEN ! COVERED PORCH ! GAME ROOM IS SPACIOUS ! TILE FLOORING THROUGHOUT FIRST FLOOR ! FRESHLY PAINTED ! MASTER BATH HAS A TUB AND SHOWER BRAND NEW CARPET !!"